After a rather cheap and cheerful debut 4K Blu-ray player last year, Samsung has stepped up its game considerably with the M9500. It performs better, it looks better, and it provides some genuinely innovative and useful features. A couple of other potentially key features have gone AWOL, though, and its UK price feels rather high. Update: Samsung has lowered the original price of the M9500 from £499 to £349, bringing it closer in line with the US price of $399. Considering that its UK price was one of the player's major flaws, and that's no longer an issue, we have decided to give it a "Recommended" award. 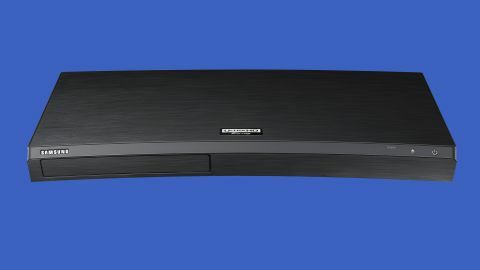 Looking back at it now, Samsung’s first Ultra HD Blu-ray player, the Samsung UBD-K8500, seems like a bit of a trial run. Its build quality was rudimental as Samsung tried to undercut rival debut units on price. It didn’t carry any sort of built-in display. Its picture quality was OK as a starting point for a new format, but was soon overwhelmed by more heavy duty rivals. And while the deck did what it needed to, its feature count was soon exposed as pretty limited. The new $399 (£349, about AU$500) UBD-M9500 feels like such a specific response to its predecessor’s limitations that you can almost imagine Samsung sitting down and ticking the old problems off one by one. The result is a far more accomplished player that deserves a seat at the serious mid-range 4K Blu-ray player table - even though a couple of deliberate omissions might frustrate some quarters of the AV enthusiast market. If you make curved TVs like Samsung does, then I guess you might as well make a curved 4K Blu-ray player, too. That said, while the curved screen on Samsung’s TVs tends to look very attractive, the curve sits a bit awkwardly on the M9500, seeming at odds with the rectangular disc tray slotted into its left side. The M9500’s build quality is a comfortable step up from that of the K8500, though. It feels heavier and sports a glossier metallic-look top panel. It’s still not as nicely built as the Panasonic DMP-UB900, though - and that Panasonic model is now available for even less than Samsung's M9500. The M9500’s biggest design improvement is the OLED display tucked into the narrow angled back area that sits at the top of the front edge. Fitting a display into such a small area (which it also shares with touch-sensitive eject and power buttons) means you’ll struggle to read the text from a typical TV viewing distance. The display looks cool, though, and any display is better than none. The M9500’s connections are typical of the Ultra HD Blu-ray player world, comprising as they do two HDMI outputs (one for video, one for audio), an optical audio output, a LAN port, and a side-mounted USB port for multimedia playback. These visible ports are supported by integrated Wi-Fi and Bluetooth. Remember, though, that the Panasonic UB900 carries a full array of audio line outputs as part of a high quality internal multi-channel decoding system. Design TL;DR: The M9500 is better built than its predecessor, and adds a very welcome OLED display. The curved shape looks a bit awkward, though. As well as its headline 4K Blu-ray playback, the M9500 can handle DVDs, HD Blu-rays and CDs. Video, photo and music files can be played from USB drives or over your network, too. The USB and network music playback includes support for the high-resolution flac, WAV, ALAC and AIFF file types. There’s no support for DVD-Audio or SACD discs, though. This probably won’t be a big deal for most people, but it’s worth noting that Sony’s UBP-X800 does support both high-end audio disc formats, and only costs £370/$299. The M9500’s star attraction - because it’s actually useful and not offered by rival players - is its Blu-ray to Mobile viewing system. Remarkably this manages to wirelessly transmit UHD and HD Blu-ray pictures from the M9500 to your smartphone. You might argue that there doesn’t seem much point buying a 4K Blu-ray player with all the picture quality that can give you and then playing its pictures on a tiny, likely not 4K phone screen. But given the ever-increasing demands on the family TV these days, it seems to me that any new way of sharing sources across different screens is welcome. It’s just a pity (if not entirely a surprise given Samsung’s phone affiliations) that the Blu-ray to Mobile feature isn’t currently supported on iOS devices. In another great sharing touch, you can also transmit audio from the M9500 to a pair of Bluetooth headphones for a ‘Personal Cinema’ experience. The Bluetooth works both ways too, meaning you can play music stored on your mobile devices through the M9500 to your TV or AV system. Or you can mirror your smart device’s screen through the M9500 onto your TV screen. The M9500 is also a cut above the competition when it comes to its smart features. While many Ultra HD Blu-ray decks get limited or aging smart TV systems - or none at all in the case of the otherwise brilliant Oppo 203 - the M9500 gives you Samsung’s slick, friendly, highly customisable Eden system. This provides access to more than 300 apps, including key streaming services such as Netflix, Amazon Video, YouTube and the catch-up services for the key UK broadcast platforms. The Netflix/Amazon/YouTube streaming even includes compatibility with 4K and HDR content. There’s additionally support for Gear 360 and YouTube 360 videos, with you using the M9500’s remote to navigate around the 360-degree images. Here comes the bad news: There are also a couple of significant features the M9500 does not have: Dolby Vision HDR support, and 3D support. Dolby Vision adds an extra layer of dynamic, scene by scene information to the normal HDR10 HDR picture stream that helps displays render pictures with better colour, light management and detailing. It’s only available on a handful of 4K Blu-ray titles to date, though, and will only work if you also have a Dolby Vision TV. What’s more, Dolby Vision-enabled discs will also play in HDR10 through non-Dolby Vision decks such as the M9500. From all this you may well conclude that Dolby Vision is not a ‘must have’ feature. More Dolby Vision titles are coming, though, and crucially the titles released to date already suggest that Dolby’s HDR format can make a big difference to picture quality. But we can finish on a bit of good news, though: the M9500 currently ships with a free copy of Planet Earth II on Ultra HD Blu-ray, at least in the UK. Features TL;DR: The M9500 is an Aladdin’s Cave of smart features and content sharing innovations. Its new attempts to simplify connection with your TV and audio equipment are welcome too. The lack of Dolby Vision and 3D support could be deal breakers for some though. The M9500 is a noticeably better performer than its predecessor in three key areas: colour, upscaling of HD Blu-rays and downscaling for HDTVs. For starters, with 4K Blu-rays colours look both richer and more refined, an improvement which in turn enhances your appreciation for the new disc format’s wider colour and extra resolution capabilities. There’s slightly better detailing in dark areas too, with the combined impact of the native 4K improvements meaning that Samsung is now at least in the same picture performance ballpark as Panasonic’s excellent UB900. The M9500 delivers a marked improvement with its upscaling of HD Blu-rays too. Upscaled pictures look detailed and cleaner than they did on the K8500 - much closer, again, to the excellent upscaling you get with the Panasonic UB900 and UB700 rivals. Perhaps the single biggest performance boost the M9500 delivers, though, comes with its ‘downscaling’ of the HDR component of 4K Blu-rays for playback on non-HDR TVs. You can now choose from three downgrading options depending on how bright your non-HDR TV is, and this helps the converted image retain more detail and colour integrity than you get with the K8500. This feature likely won’t impact many people; most 4K TVs that have been sold for the past three or four years have supported HDR. But it’s still a welcome area of improvement, and could at least prove useful in the projector world, where its more common to find 4K support with no HDR support. While the M9500’s pictures are excellent so far as they go, though, there’s no getting round the fact that it might have been hit even greater heights if it supported Dolby Vision. That said the M9500 is one of the quickest 4K Blu-rays we’ve seen, combining fast disc loading with speedy, slick onscreen menus. It underlines the impression of being better built than its predecessor, too, by running more quietly; there’s precious little racket from the disc drive or any cooling fans. Backing up the M9500’s strong picture performance is rock-solid audio. For instance, the auto-detect system for Dolby Atmos/DTS:X really works and makes it significantly more likely that all users will experience the full potential of their AV system. The sound produced - be it Atmos, DTS:X, DTS Master HD, Dolby True HD or plain old Dolby Digital/DTS 5.1 - seems crisp, dynamic, clean, meaning that any issues you may experience are likely created elsewhere in your audio ‘chain’. Performance TL;DR: Strong picture quality and fast, stable operation make the M9500 an above-par performer. Dolby Vision and built-in multi-channel decoding might have taken its performance to an even higher level, though. The M9500’s £450 UK price makes it £80 dearer than the Panasonic UB900, even though that Panasonic deck adds 3D support and high-end built-in audio decoding to its excellent 4K Blu-ray playback. Sony’s UBP-X800, similarly, adds SACD support and 3D to an all-round performance similar to the M9500 yet costs just £399/$299. Finally, LG’s debut Ultra HD Blu-ray player, the UP970, provides the Dolby Vision and 3D support missing from the M9500 despite costing just £380/$299. The first model from Samsung’s second wave of 4K Blu-ray players is a supremely confident and capable affair. It outperforms its predecessor in pretty much every area, and it introduces a range of innovative and genuinely useful smart features that make the smart systems of rival decks look primitive. A refusal to support either Dolby Vision HDR or 3D might force some sections of the AV world to look elsewhere, though, and the deck looks too expensive at its current price to compete against a number of key rivals.